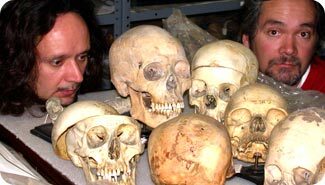 Jamex de la Torre (b. 1960, Guadalajara, Mexico) is a sculptor who primarily works in glass with his brother, glass artist, Einar de la Torre (b. 1963, Guadalajara, Mexico). The brothers moved to California in 1972 and graduated from California State University Long Beach. Their work is based on their Mexican-American bi-cultural experiences, and because they use a combination of critical thinking, glass, found objects, and mixed media their work is known for being unique. Sarah Jaeger (b. 1955, West Simsbury, Connecticut) is a ceramist who works in Helena, Montana. She received a BA from Harvard College and a BFA from the Kansas City Art Institute. Jaeger creates functional porcelain pottery, often thrown and altered, and glazed using wax resists, creating layers of color. 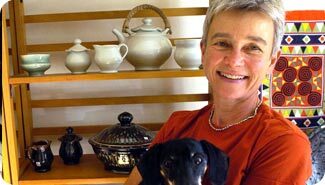 She has taught at the University of Nebraska, Lincoln, New York State College of Ceramics at Alfred University and Pomona College. She also served on the Archie Bray Foundation Board of Directors for 10 years. Ken Loeber (b. 1948, Milwaukee, Wisconsin) is a jeweler who works in Algoma, Wisconsin where he lives with his wife Dona Look and their son Reid Loeber. 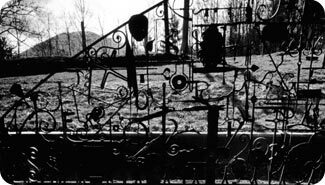 He graduated from the University of Wisconsin, Milwaukee with his BFA in 1970 and MFA in 1978 in sculpture. The pieces often consist of an organic form joined with a construction of sheet gold to augment or oppose the shape or concept. He has exhibited his work at the American Craft Council fair for over 20 years with his wife, Dona Look. 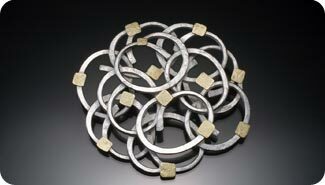 He has received many awards including an NEA grant and the artistic excellence award from the American Craft Council. Dona Look (b. 1948, Port Washington, Wisconsin) is a basket maker who works in Algoma, Wisconsin where she lives with her husband Ken Loeber and their son Reid Loeber. She graduated from the University of Wisconsin, Oshkosh in 1970. She collects the bark from the region’s birch trees, uses it to weave her baskets and sews them together with silk thread. 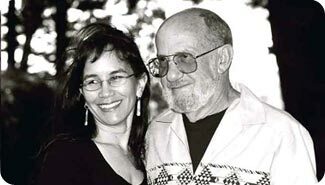 She has exhibited her work at the American Craft Council fairs for over 20 years with her husband, Ken Loeber. She has received two fellowships from the NEA. Mississippi Cultural Crossroads is the local arts agency in located in Port Gibson, Mississippi. Mississippi Cultural Crossroads is a performing arts center involved in documenting the culture of the community for over 25 years. It provides summer and after school art programs, and is where Crossroads Quilters display and sell their hand made quilts. Crossroads Quilters is a group of women who create quilts, celebrating the traditional quilting heritage of their community, while creating educational and economic opportunities for its citizens. Penland School of Crafts is located in Penland, North Carolina and was founded as a national center for craft education. Lucy Morgan established the school’s craft roots when, after attending Berea College for some months in 1923, decided to revive hand-weaving. She organized the Penland Weavers and Potters craft group, and was eventually able to establish a working craft school. 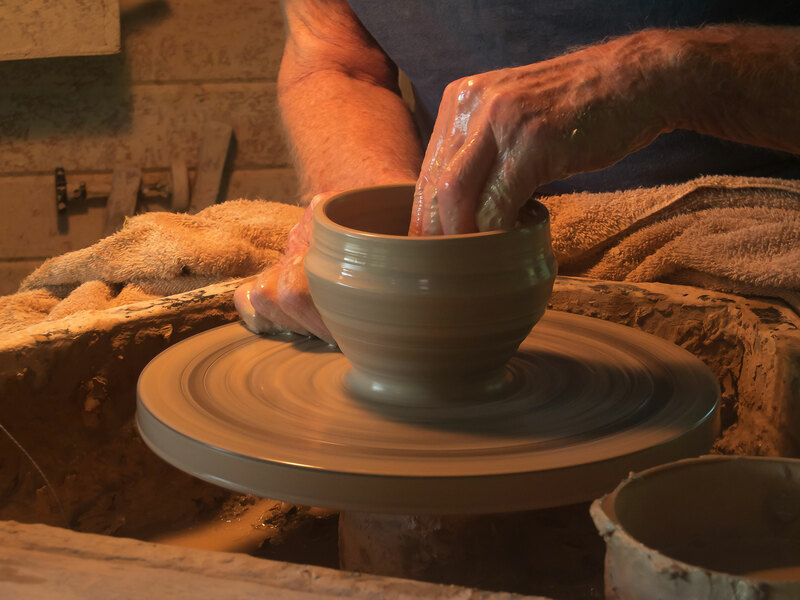 Penland School of Crafts now offers classes in the Spring, Fall and Summer in a variety of media, including pottery, glassblowing, metalworking, weaving, as well as painting, photography, and printmaking; however, academic degrees are not awarded. Pilchucks Baskets by Dale Chihuly, 1980. Photograph courtesy of Chihuly Studios, All Rights Reserved. 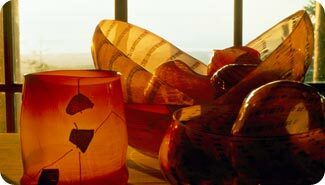 Pilchuck Glass School was founded in 1971 by Dale Chihuly, Anne Gould Hauberg and John H. Hauberg. Pilchuck is an educational center for artists working in glass and is located in Stanwood, Washington. From May to August Pilchuck offers 25 intensive residential sessions. Hystercine Rankin (b. 1929, Lorman, Mississippi) learned quilting from her grandmother at the age of 12 and started making quilts to keep her family warm. She creates traditional quilts like the log cabin, but she creates her own unique versions of them, utilizing colors and shapes to create distinctive works. She also uses appliqué and embroidery to create quilts that portray family stories and her memories. 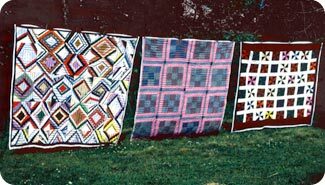 Mrs. Rankin has taught people to quilt at Mississippi Cultural Crossroads in Port Gibson, Mississippi since 1988, and is a member of the Crossroads Quilters. 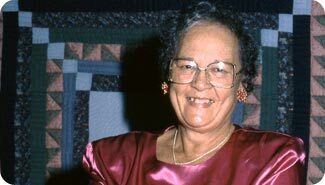 She was recognized in 1997 for her accomplishments when the National Endowment of the Arts awarded her with a National Heritage Fellowship. Denise Wallace (b 1957, Seattle, Washington) is a jewelry artist of Native Alaskan Aleut descent who works with her husband, Samuel Wallace (b. 1936, Calvin, Virginia). She maintains and modifies a walrus-ivory carving tradition. She is most well known for her elaborate belts which depict people, animals, symbols and folk tales of her native culture. 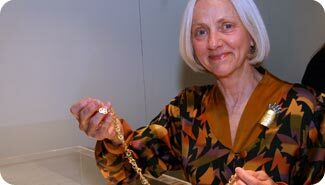 They use fossil ivory, silver, gold, and richly colored stones to illustrate her rich culture.